In international cricket, each team should treat its opposition with utmost respect. No matter how formidable a team, it would be a mistake of monumental proportions to underestimate an opponent as the game has a nasty habit of biting you in the backside if you take it for granted. India has an almost infallible record at home in Tests. Out of the 32 Test series that they have played at home since the dawn of the new millennium, they have won 24, drawn 5 and lost just 3. This is an impregnable record, but they would still be well advised not to underestimate the West Indies, as the 2 teams face off in a 2 Test series that started on 4th October 2016. However, they can use the Test series to tinker with the composition of their playing XI a bit. They can try out a few experiments keeping in mind the tour of Australia later this year. India have never won a Test series in Australia in 11 attempts: they have drawn 3 series and lost 8. Australia will be without Steve Smith and David Warner and this is a golden chance for India to register their maiden Test series win on Australian soil. Here are 5 things India need to pay attention to in the Test series at home which will stand them in good stead when they tour Australia. Identify who will open against Australia without chopping and changing. India have won 5 Tests in Australia. In the 9 innings that they have batted, the openers have had 1 century partnership, 3 fifty run partnerships and 3 in excess of 40. It is rare for a team to do well in a match, let alone win a Test series in Australia, without a sizable contribution from their openers. KL Rahul is almost certain to open both against West Indies and Australia, and India need to identify whether his partner will be Mayank Agarwal or Prithvi Shaw. As they have chosen Shaw, and he has done well, they should play him in both the Tests against the West Indies. It will be a recipe for disaster if an untested debutant is blooded directly in Australia. Shaw should be given a proper taste of international cricket at home so that he has some valuable experience before he opens in Australia. Kuldeep Yadav should play in both the Tests. On the tour of England, it was clear that Kuldeep was considered the 3rd spinner in the Indian side after Ravichandran Ashwin and Ravindra Jadeja. He was even omitted from the squad for the last 2 Tests against England. Over the years, it has been observed that finger spinners have a tough time in Australia whereas the wrist spinners tend to do better. To put things in perspective, bowlers like Daniel Vettori, Graeme Swann and Muttiah Muralitharan have averages of 40.18, 52.59 and 75.41 respectively in Australia, whilst bowlers like Bhagwat Chandrasekhar and Anil Kumble average 30.27 and 37.73 respectively. Even Ashwin averages 54.71 in Australia. Therefore, Kuldeep might be a better bet against the Aussies. To do that, he needs to be given the confidence boost of starting both Tests against the Windies so that he is in a good frame of mind when the 1st Test against the Aussies commences on 6th December. Have clear plans for the number 5 and number 6 positions. Virat Kohli has always said that he wants to play 5 bowlers rather than 6 batsmen, as he feels that they need 5 bowlers to pick 20 wickets overseas to win Tests. This is fine in theory but on Australian pitches, which assist the fast bowlers with plenty of pace and bounce, they might need to play 6 batsmen. Karun Nair has been inexplicably dropped from the squad facing the West Indies, but Hanuma Vihari has been selected. Ashwin and Jadeja have been selected ahead of him for the first Test, but it would make sense to play Vihari at least in the second Test as he would then get a feel of Test cricket, rather than throwing him in the deep end against Australia. Identifying specialists in the slip cordon and persisting with them. In the past, India have been guilty of dropping a lot of catches in the slips, though they put in a much-improved show against England. KL Rahul has shown that he has a safe pair of hands and he caught everything in England. At the moment it looks unlikely that Shikhar Dhawan and Murali Vijay will make the cut for Australia. Therefore, Pujara will have to man the slips for the entire series against the Windies. India need to be clear in their plans for Ajinkya Rahane. Rahane stands in the slips to the spinners but for some inexplicable reason stands at gully for the pacers. This is fine, provided one of the 3 newcomers – Shaw, Agarwal and Vihari – are groomed for fielding in the slips. In Australia, there will be a lot of catches going to the slip cordon and India can afford no slip ups. Tail-enders need to be given responsibility with the bat. The main reason for India’s defeat against England was that the English lower order (positions 7 to 11) contributed a lot of runs with the bat while India’s last 3 wickets were sitting ducks. India’s batting will be boosted with the presence of Bhuvneshwar Kumar, who has been rested for the West Indies series, but Ashwin and Jadeja should be told in no uncertain terms that they need to show more initiative and contribute with the bat against the Windies. 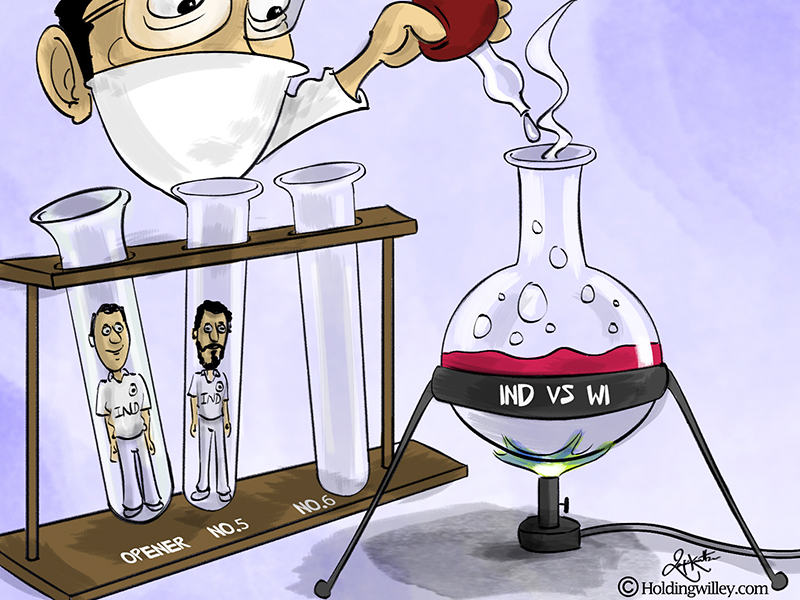 At home, India’s top order scores heavily and runs from the lower order are not very vital. But in Australia, both Ashwin and Jadeja and even Pandya will be needed to enable India to post competitive totals. Even Kuldeep has a bit of talent with the willow and he will need to knuckle down and score some runs.